Archaeology and Heritage Education is Important! There is a huge disconnect between an avid and enthusiastic interest in heritage and the amount of heritage and archaeological sites being destroyed worldwide. Education and outreach is absolutely paramount in bridging this disconnect. As a discipline, we’ve got a lot of work to do! 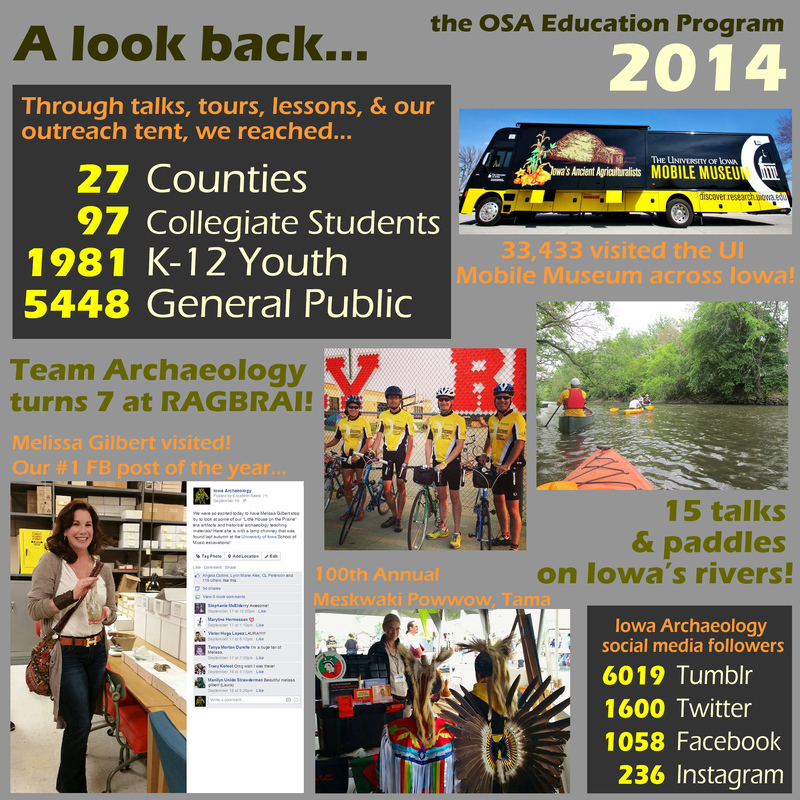 It’s been an exciting past few months in the realm of archaeology and heritage education, and the University of Iowa Office of the State Archaeologist is happy to be a part of the national conversation. Spurred by discussions initiated at the 2014 Society for American Archaeology annual meeting last April in Austin, Texas, archaeology educators from across the country agreed that we need to have more conversations about where our discipline is headed, we have to create a stronger, more communicative network, and we need to be more proactive with establishing and achieving goals. This prompted the development of two recent national archaeology education conferences. The National Archaeology Education Conference was held at Crow Canyon Archaeological Center in Cortez, Colorado in October, and Building a Strong Future for Archaeological Outreach and Education: A Working Conference for Educators was held last week at the Archaeological Institute for America’s (AIA) annual meeting in New Orleans. The National Archaeology Education Conference was held in conjunction with the Project Archaeology biennial meeting, and the Project Archaeology team did an outstanding job organizing the event. OSA’s Cherie Haury-Artz and I, who are both Project Archaeology coordinators for the state of Iowa, were part of the team of 41 archaeologists, teachers, graduate students, and informal educators, along with staff from Crow Canyon Archaeological Center, who assembled for the 5-day retreat. Overall, we established our common ground as a diverse group of educators from a variety of institutions, discussed common goals and needs for archaeology/heritage education, and identified ways to professionalize and sustain archaeology education as a discipline. A comprehensive report on the participants, working sessions, literature circle, vision for archaeology/heritage education, and actions items from this conference has been developed by Project Archaeology, who would be happy to share. A brief overview is available in their December 14 newsletter, so I won’t cover it here. Cherie and Elizabeth at the Dillard Site field trip during the National Archaeology Education Conference. In preparation for the Building a Strong Future for Archaeological Outreach and Education conference in New Orleans, Ben Thomas and Meredith Langlitz of the AIA asked me to lead a 2-hour session on “State and Regional Approaches to Outreach and Archaeology,” because of all of the great work being done in Iowa. How awesome is it for our program to be nationally recognized! Last year alone, Cherie, other OSA staff, and I reached over 7500 people in 27 Iowa counties through our Education Program. I credit this to the strong foundation created by my predecessor Lynn Alex, as well as all of the wonderful programs and partnerships she established during her tenure. Before Lynn created the Education Program in the early 1990s, State Archaeologist Marshall McKusick (1960-1975) and others highly valued statewide public outreach. With the establishment of the OSA as a University of Iowa research unit in 1959, this makes us one of the longest running statewide outreach programs at UI! In addition to continuing the hard work with statewide outreach started by Lynn, who retired in 2013, the OSA Education Program has had a surge in social media followings that contributes to our national recognition. We have also been and continue to be a strong partner in the development, administration, and implementation of the University of Iowa Mobile Museum along with the Pentacrest Museums and under the Office of the Vice President for Research and Economic Development. In schools, archaeology is commonly relegated to history or social studies classes. Although this is a natural fit, archaeology is highly multi-disciplinary and interdisciplinary! If we want to get archaeology education into more schools, we need to think outside of the box. Realizing that all teachers cannot think “archaeology first,” archaeology educators should use archaeology as a tool to manage subjects, i.e., don’t teach archaeology, teach with archaeology. During this session, we discussed creative applications of archaeology to teach sciences, math, English, music, art, technology, and more. 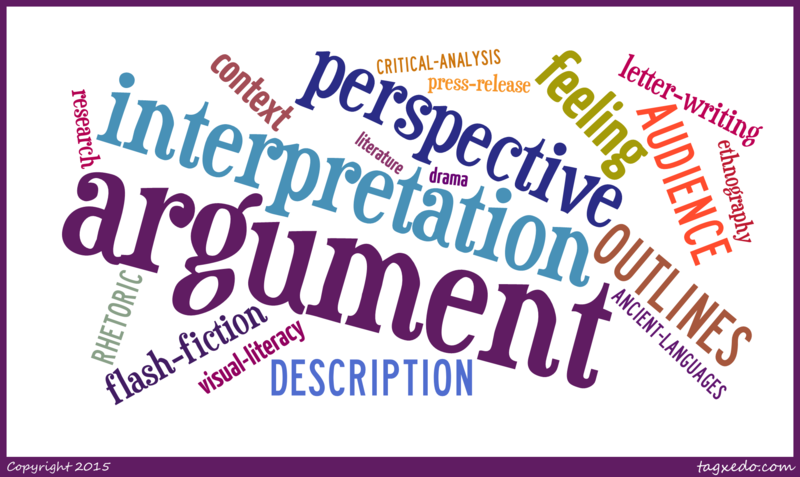 With English alone, we brainstormed this comprehensive (but not entirely complete!) list of English-related topics that could be taught using archaeology. We also heard real-world examples of students excelling through archaeology-related lessons. For one, students who have learned art and perspective have excellent math and mapping skills, which is a great reason for archaeologists and educators to not underestimate art! Concerning math, through hands-on, authentic mapping activities as a physical application of trigonometry, students were able to self-correct and understand this otherwise difficult concept. English-related topics that could be taught using archaeology. Find out WHY archaeology is important to your volunteers. This can lead to more meaningful experiences and interactions on all parts. "Those who know they're contributing to knowledge and history are more excited than those who just find arrowheads." Archaeology is more than a dig. Archaeology is a process. We need to link culture with the past. Emphasize who the artifacts belong to and emphasize interpreting culture. Do not emphasize discovery. Emphasize to teachers: the ethics are part of the lesson! Public archaeology education needs to address MULTIPLE publics. Minority students’ visions of an archaeologist are typically older white males. This is a commentary on who the public thinks does archaeology and how it relates to them. After this discussion, we worked on compiling a draft 21st century framework for ethical guidelines for heritage/archaeological outreach and education. More developments soon! Is your school more than 50 years old? Get students to go through the archaeology site listing process! They can learn archaeology skills with no travel involved. Service learning has many benefits and ties in well with archaeology. Students learn, apply knowledge, and give back to their communities. Teachers and archaeologists have successfully used crowd funding for secondary education archaeology projects. Look up your community foundations for funding ideas like grants or funding management. These organizations are highly underused! High school students are conscientious and diligent participants with archaeology fieldwork, even internationally! Several archaeologists and educators in attendance are running successful international fieldwork opportunities for high school students. Do you know of archaeology opportunities for high schoolers? The team would like to generate an accessible list for others, and I am happy to pass information along. This session had two goals. The first was to highlight the diversity and accomplishments of organizations doing statewide archaeology outreach and education across the country. The second was to collaboratively brainstorm solutions to challenges that organizations face with conducting archaeology education and outreach. Archaeology education program highlights were featured with a trivia game created using an interactive online gaming pedagogy website called Kahoot. This game is open to the public to anyone registered on Kahoot, so give it a go! If you’re not familiar with archaeology education program across the country, you may not get many answers correct, but you’ll learn about some fun and unique approaches others are taking to teach archaeology. Side note, Kahoot is also great for creating online surveys and discussions, and it serves as a great assessment tool. Click on the image to be redirected to Kahoot! The second half of the session was spent addressing challenges to doing archaeology outreach. We split up into four discussion groups with me, Gywnn Henderson (Kentucky Archaeological Survey), Ryan Harke (Florida Public Archaeology Network), and Lindsay Randall (Robert S. Peabody Museum of Archaeology) helping to facilitate the discussions using a reverse brainstorming technique. Prior to the meeting, this group came up with five challenge topics based on our collective experience with outreach: important messages (what are we trying to get across? ), funding, defining success, audience buy-in, and staff sustainability. We approached each issue by first asking, “what are we doing to cause or contribute to these problems?” and then worked towards solutions. With five topics on hand, we realized we might only have time to discuss no more than two. However, all information was captured as a survey in Google Forms, so we can revisit what we did not finish in the two-hour session. In addition, anyone who does archaeology education or outreach but could not attend this conference can also fill out the survey and contribute to collectively building solutions. Would you like to contribute? Do so here! All responses are automatically saved to a spreadsheet for sorting and identifying patterns. I look forward to disseminating these responses, which are already a great resource for those needing fresh approaches to outreach and education. Are you an archaeology or heritage educator? Please take this survey! Two consecutive sessions took place on Saturday morning. A teacher workshop on Archaeology and Critical Thinking in Your History/Social Studies Classroom was facilitated by Shelby Brown of the J. Paul Getty Museum. This workshop welcomed New Orleans-area teachers, as well as those attending the conference, to learn about how teaching archaeology could enhance critical thinking and address Common Core literacy standards. The Archaeology Show and Tell showcased the participants’ favorite teaching materials, including curricula, websites, lesson kits, and more. I look forward to hearing more summaries of these two sessions, since I was running the Project Archaeology booth at the exhibit hall during that time. How do you measure the success of your education programs? 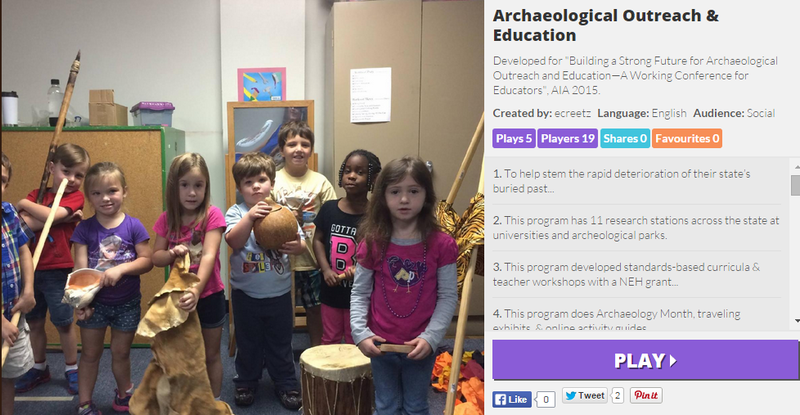 When it comes to archaeology education and outreach, are you doing research and evaluation? If so, do you publish that information? Although many practitioners are, we learned that we are not doing enough! If we want to work on professionalizing the discipline, prove that we are making an impact, generate more funding, and integrate ourselves better with schools, we need to do more research and publication. From the existing research, we learned some interesting anecdotes from Gwynn Henderson. For example, some studies show that kids do not connect objects with cultures… yet archaeology in its most basic sense is telling stories with objects. Also, kids have positive attitudes about archaeology, but they do not see how it's linked to now. Finally, many people think that those who created simple technology had simple minds. Promoting engaged understanding through archaeology education can change those misconceptions! As break-out groups, we discussed more potential research topic areas, drafted benchmarks for archaeological literacy, talked about avenues for publication and professionalization, and brainstormed creative informal learning and assessment opportunities. We will continue to work hard going forward to create, disseminate, and share this information. 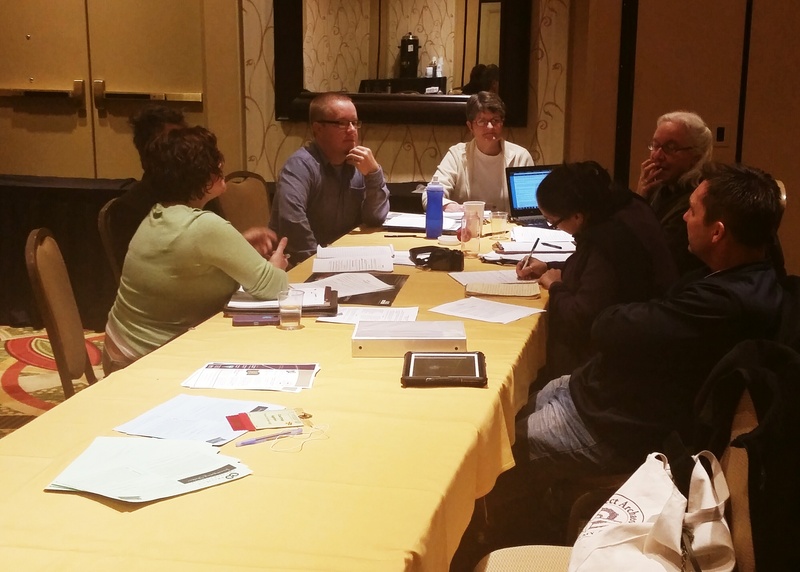 A team works to draft archaeology literacy benchmarks. As archaeology educators, "We are ALL in business," says Clark Wernecke. This is true. Without efficient promotion and marketing of what we do, we will not have successful programs. Clark provided the group with some “Marketing 101”, ultimately advising us to make our audience our main focus. “It's all about THEM. Take yourself out of the equation." As a profession, we need to steer our outreach away from promoting archaeology for archaeologists. In terms of marketing our programming and curricula to schools, it is best to show how students are excelling with archaeology framed from standards, not boxed within them. Teachers are making it work! The group also shared successes and failures with marketing, and talked about the power of social media, professional incentives, and food. Yes, food! This was an incredibly rewarding conference, especially when combined with what we accomplished during the National Archaeology Education Conference at Crow Canyon Archaeological Center last October. There were several good takeaways from our discussions and several future action items to address. First, there has been a lot of great work done in the past 30+ years. We need to build on what is there and move forward. Also, we need to create core values and best practices to build from, with guidelines and benchmarks. Research, evaluation, and publication are crucial, including doing more preliminary and post assessment at informal events. We have to start somewhere, and having a professional organization of archaeology/heritage educators and a dedicated archaeology/heritage education journal to collectively publish in our research in would be a dream come true.